The "Global March on Jerusalem" is officially underway. The prospect of hundreds of thousands of "peaceful" protesters massing on Israel's borders, backed by international sympathies and dizzying media coverage is frankly frightening. What boggles the mind is how many ostensibly intelligent people have been swept up in the hysteria around the "Judaization" of Jerusalem and the rhetoric of the Middle Easts' only democracy being an "Apartheid State". 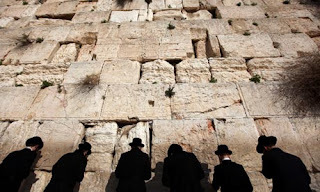 Yet, academics, politicians, journalists and even some Jews seem to subscribe to the ongoing and escalating fictions leveled against the millennia-old epicenter of Judaism. Next Friday evening, as we sit at our Seders, we will read how "in every generation, they have risen against us to destroy us". Well, that hasn't changed. We'll also read how each time "The Holy One Blessed Be He saved us from their hands". That won't change either, which is the good news. Meanwhile, as the drama unfolds (and tomorrow could prove to be a very challenging day for the Israeli government- something akin to the Arab Spring), we need to know how to think and respond as Jews. Jerusalem is the keystone of our nation. We pray three times a day facing Jerusalem and ask G-d multiple times daily for Jerusalem's restoration. To us, the ultimate purpose of Creation is to return to our Temple in Jerusalem. Jewish mysticism teaches that everything exists in time, space and within the human. As Yom Kippur is the year's holiest day, Jerusalem is the world's holiest location. Within us we each have both a Jerusalem and a Yom Kippur. Jerusalem, or Yerushalayim in Hebrew, refers to a perfect, wholesome relationship with Hashem. Our personal Jerusalem is the part of our soul that is completely dedicated to G-d and absolutely proud of its Jewish identity. Throughout history, nations have challenged our hold on Jerusalem and we have lost is multiple times. Likewise, we have each faced challenges against our own fundamental Jewish connection and identity. Only this time, the challenge to Jerusalem is not by those who wish to conquer it as much as by those who wish to claim it was never ours to begin with. This spiritual battle is not for us to fail as Jews, but to lose our sense of what it is to be Jewish. Recently, young Jewish people seem to have lost the typical South African sense of Jewish tradition. More young people are questioning why they should fast on Yom Kippur or avoid eating bread on Pesach. Way more are inter-dating and intermarrying. Jerusalem, the holy epicenter of Judaism, is being challenged in an unprecedented fashion. Now is a critical time for us to stand proud as Jews. Now is a the key time to decide for ourselves and convey to our children that Jerusalem is eternally Jewish and non-negotiable; that no matter how unpopular a position it may be, Jewish pride and Jewish values are what define us- and these can not be compromised. Ever. May G-d help us to stand proudly Jewish, may He protect Israel from its overt and covert enemies and may we all join the Global March to Jerusalem with Moshiach now! HEY, IT'S PURIM. ARE YOU READY? Learn everything- in just one year!